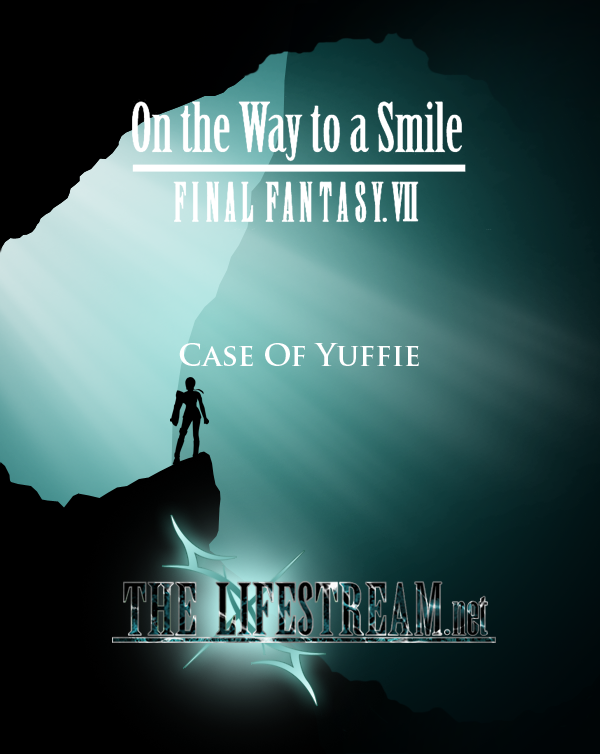 You have been waiting quite some time for the next On the Way to a Smile Audiobook, but Pixel has finally completed his latest work: On the Way to a Smile: Case of Yuffie. The Audiobook is available for you in MP3 format for easy listening and transportation at the link below. You can also listen to the Audiobook via the embedded YouTube clips below. There are additional segments beyond the fold, so click “Read the rest of this entry” at the bottom of the article to see the rest. Once again, please give a rounde of applause to all the people that helped to make this. We hope that you enjoy this latest presentation and look forward to your comments. Even the ungrateful nitpicky ones. Nobuo Uematsu – Hurry Faster! The link needs to be changed for the third video. Where can I find the songs by HypochondriacPiano FFVII main theme and The Promise Land? The main theme is just after the first round of “stolen materia” in the scene in the forgotten city. Promised land is while Yuri is telling yuffie and nanaki what happened before going back to wutai. This really was an amazing job you made. It was really fun and exciting. Again, like all the previous audiobooks, I closed my eyes while listening to it, and thanks to your hard work; both on the voices and the background sounds, it felt like I was watching a movie. Imagination, it was no longer mine. I am now officially a crazy fan of your audiobooks, and I am looking forward to the next one >.< Love you guys, you're great!!! Thank you for yet another awsome release! I liked this audiobook just as much as the previous ones. You sure put in alot of effort in these and it is much appreciated! Being a fan of your audiobook releases, I will continue to listen and eagerly awaiting the next entry in the series =). Is it Case of Nanaki or Shinra next? I’m definitely a fan of Tifa and Cloud’s voice talents! Kudos to everyone for the masterpiece!!! When will the new FFVII audiobook come out?